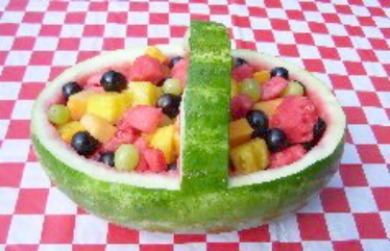 Watermelon Salad is an old fashioned recipe made with fresh fruit cantaloupe, grapes, pineapple, and cheese. Included is How To Make A Watermelon Basket. 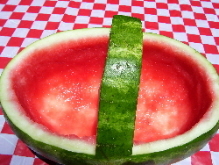 It was popular in the 1970s as a decorative and fun way to serve up watermelon at family gatherings or picnics. August 3rd is National Watermelon Day each year to celebrate. This fruit makes you feel great with it's lush, various delicious flavors! It contains an abundance of antioxidants vitamins A, B-6, and C, which boosts our serotonin. It contains Potassium for energy and Lycopene which provides gorgeous colors for our health and dining pleasure. It also makes a great table centerpiece for your outdoor and other Summer parties. Carve your basket per instructions below. Gently place fruits into bowl arranging them as you like. Cover bowl and chill fruit in the refrigerator several hours. Select an attractive, blemish free (if possible) watermelon with a slightly flat bottom that will prevent it from rolling around on the table. Wash the outside of your melon to remove any dirt or residue. Measure it's height with a ruler or tape measure. An excellent way to do this is to stand a ruler up on it's end and mark where you want the top of your basket to come to with toothpicks as in the first image below. Our melon was 8" high and we marked it a 5" high. Then mark where you want your handle to go and the width you want it. We marked ours 2 inches. The handle is part of the design. It is for aesthetic purposes only. After measuring, carve your basket using a medium sharp kitchen knife like the first image below below. 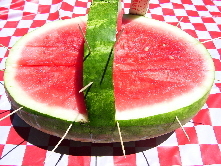 Use the toothpicks as guide lines. It is easier to carve by cutting your horizontal lines first, followed by the vertical lines. Avoid cutting through the rind, causing a leak. To easily remove the melon you need to shape your basket, cut each part to be removed into 4-6 wedges and remove them by gently pulling out with your fingers. Gently remove chunks of melon from within the bowl with a slotted metal spoon letting the excess juice drain back into the bowl. Place them in a mixing bowl to cutting into cubes later. After all usable melon is removed, scrape the inside and remove all excess juice. Save this delicious, vitamin packed juice to drink or use in another recipe. If it is difficult to pour all the accumulating juice out, use paper towels to sop up excess, rendering your basket as dry as possible before filling with your fruit salad. Best if eaten within a couple of days. After salad is consumed, use the rind to make watermelon pickles. Use your imagination and creativity to design future baskets. They make a colorful focal point for your table or buffet. If giving this Watermelon Salad Basket as a gift, place in a leak proof container to catch any juice leaks. This salad is best if consumed within 24 hours.